You think it’s a provocative title right? Honestly – why are you here? To watch a beheading video? So. Did you search in Google for beheading videos? Videos in which prominent Western victims such as Peter Kassig, Steven Sotlof and Alan Henning’s heads were separated by terrorists of “the Islamic State”? Then you’re in the company of millions of people actively searching for beheading videos online. An archaic horror that has gathered people for centuries in places of execution? A question that far exceeds the themes of modern media society and that requires a thorough examination of people’s souls. In her TED Talk, anthropologist Frances Larson explores the question of why and how ISIS’s (Islamic State) decapitations could become a media spectacle, captivating millions of people. 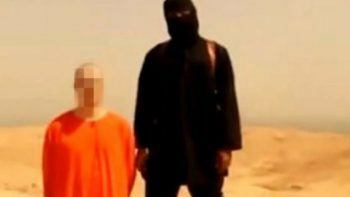 Here is the TED Talk on the Islamic State beheading videos. In a survey of more than 3,000 U.S. residents scientists at UCI found that 20 percent had watched at least part of a beheading video, while 5 percent said they had watched an entire one. Survey participants were more likely to say they had watched the beheading videos if they also said they were male, Christian or unemployed. Those who reported watching television more often were also more likely to view the videos. So, too, was fear of future terrorism associated with greater likelihood of watching. Prior mental health conditions were not significant factors, but a lifetime exposure to violence was. The offer is aimed at applicants of different backgrounds with completed studies, who have already published a lot and/or have experience with the planning and implementation of scientific publications. It is a part-time job for a project duration of 2 years. In cooperation with an American Science Foundation, a unique cosmology of knowledge is being created which interdisciplinaryly links the latest scientific findings from physics, philosophy, art and technology. Duration: 24 months with possibility of extension. How can businesses navigate in a time of Morality Recoded? We are reaching the limit of the ‘move fast, break things’ mentality that Silicon Valley has pioneered for the past decade. With Facebook and Twitter under threat of regulation, and Amazon on the edge of becoming a monopoly, it is clear we need new rules in place. The Trend Briefing of our friends at the London based Future Laboratory will examine how businesses can navigate a time of Morality Recoded as we define a new global, humanist moral code. They will examine how changing consumption behaviour is leading to a Post-growth Society and how brands’ presence must focus on new touchpoints and a less nefarious form of Subconscious Commerce. A must for modern age marketers. March 14th 2018. London. Hope to meet you there. Scott Thrift created two divine pieces of contemporary art which transform the tension and stress behind the idea of time into tranquility and peace. The two minimalist timepieces are numberless clocks, their faces being reinforced custom glass which open up your living space, giving it a vibrant equanimity. Thrift’s exceptional design results in wall clocks which are a unique and irreplaceable part of home décor for any modern apartment. TODAY is a timepiece which brings serenity into your home with the pallet of cool shades of blue and purple. Thrift has created a wall clock which masterfully melts the colors of placidity together, ironically transforming a wall clock into a piece of art which represents stillness and exudes calmness. TODAY is a piece available with or without the brushed stainless steel frame (TODAY and TODAY Open), allowing the clock to fit in perfectly with a different number of contemporary pieces of furniture, becoming an integral part of the design of your home. ThePresent is a more vivacious piece, adding a certain flavor of joie de vivre to the space it enriches with the warm tunes spilled across the glass. As is the case with TODAY, the wall clock has an inviting reinforced custom glass face, it is numberless, silent, and has a brushed stainless steel body. Thrift’s flawless craftsmanship turned the simple timepiece into a vehicle for the transmission of a tranquil livelihood and a thirst for the simple pleasures of life. It is an original piece of art which redefines the space it decorates. 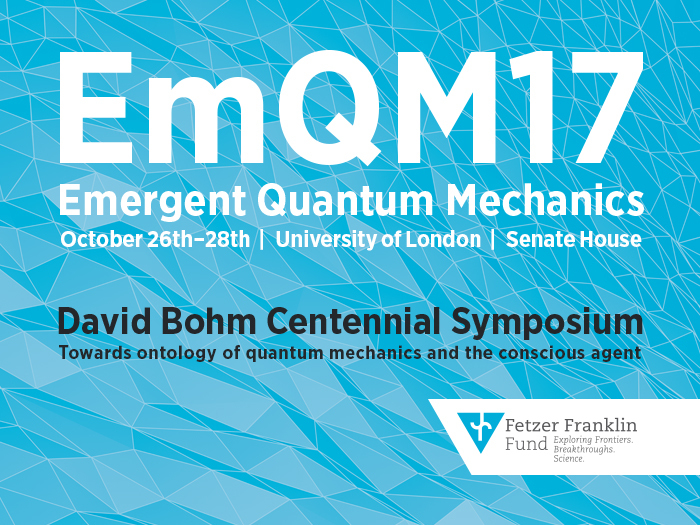 As the lead agency for the Fetzer Franklin Fund we are very proud to announce the EMQM17 Symposium in London this year. 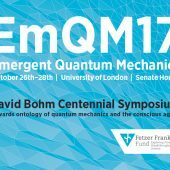 On the occasion of David Bohm’s 100th birthday, a symposium on emergent quantum mechanics will be held at the University of London, Senate House, on October 26 – 28, 2017. This special issue features expert views that critically evaluate the prospects and significance – for 21st century physics – of ontological quantum mechanics, an approach which David Bohm helped pioneer. In original de Broglie-Bohm theory, the mathematical formalism refers to hypothetical ontic elements (e.g., John Bell’s “beables”) such as the quantum potential. In the 21st century, realist quantum approaches often distinguish between ψ-epistemic and ψ-ontic ontological quantum theories. Unlike ψ-ontic theories, the ψ-epistemic theories do not view the wave function ψ as a state of reality. Nevertheless, both types of approaches posit – again – the possibility of an ontological foundation for quantum mechanics. For information about the EmQM17 David Bohm Centennial Symposium please visit www.emqm17.org. For information on the Fetzer Franklin Fund please klick here. Emergent quantum mechanics (EmQM) is a research program that explores the possibility of an ontology for quantum mechanics. The resurgence of interest in realist approaches to quantum mechanics, including deterministic and indeterministic ones, challenges the standard textbook view. For example, standard “no-go” theorems against the possibility of realist, i.e., ontologically-grounded, quantum mechanics are increasingly recognized as falling short of their stated aim. Recent work also indicates that traditional assumptions and theorems such as nonlocality, contextuality, free choice, and non-signalling, need not necessarily contradict the existence of certain quantum ontologies.